Woollatt Building Supply is the largest stocking GSD (Gypsum Specialty Dealer) distributor of gypsum products in London and surrounding area. We stock product from all 4 of the major drywall suppliers: CGC, Continental Building Products, CertainTeed and Georgia Pacific. 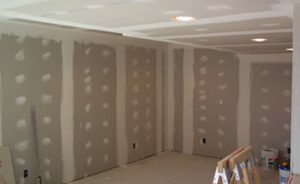 With drywall loads every week we can also get special order material quickly. ABOUT CERTAINTEED: Through the responsible development of innovative and sustainable building products, CertainTeed has helped shape the building products industry for more than 110 years. Founded in 1904 as General Roofing Manufacturing Company, today, CertainTeed® is North America’s leading brand of exterior and interior building products, including roofing, siding, fence, decking, railing, trim, insulation, gypsum and ceilings. A subsidiary of Saint-Gobain, one of the world’s largest and oldest building products companies, CertainTeed and its affiliates have more than 5,700 employees and more than 60 manufacturing facilities throughout the United States and Canada. ABOUT CGC: For more than 100 years, CGC has built an ever-growing portfolio of groundbreaking products backed by unparalleled service. CGC Inc. is a leading marketer, manufacturer and distributor of gypsum wallboard products, interior finishing materials and suspended acoustical ceilings in Canada. CGC began in Nova Scotia, Canada in 1907. It was first known as Canadian Gypsum Company and concerned itself primarily with the quarrying and exportation of gypsum rock to the United States. Today, after decades of product development and market expansion, CGC is recognized as a key player in Canada’s dynamic building materials industry, supplying innovative wall and ceiling products to the new construction and repair and remodel markets of the residential, commercial and institutional sectors. ABOUT CONTINENTAL BUILDING PRODUCTS: Formerly Lafarge Gypsum, Continental Building Products is a North American leader in wallboard and joint compound materials. Their heritage in North America stretches back to 1956 when Lafarge first established its presence in the continent. Lafarge entered the drywall market in the 1990s and began embracing synthetic gypsum as a primary raw material near the decade’s end, as synthetic gypsum offered a new level of product consistency and environmental sustainability. In 2013, Lafarge Gypsum transformed into its own company – Continental Building Products, a name that honors their renewed focus on North America. ABOUT GEORGIA-PACIFIC: At Georgia-Pacific Gypsum, more than 40 years of accomplishment and innovation have helped them deliver products that are durable, reliable and — for Dens® Brand products — resilient. These critical factors help meet performance expectations for long-lasting buildings. The wide array of Dens fiberglass mat panels and traditional ToughRock® panels are battle tested and known for high-quality performance. Above all, the most accurate description of these panels is strong.